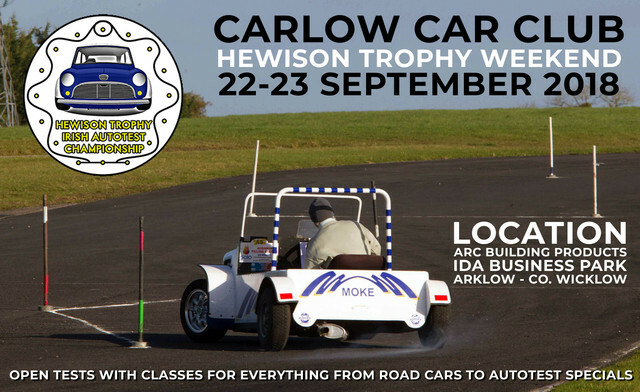 The Hewison Trophy - Motorsport Ireland National Autotest Championship moves on to Arklow, Co. Wicklow for rounds 3 & 4 of the season for a double header organised by Carlow Car Club on the 22nd & 23rd of September, get those cars ready! Once again the club have managed to secure a fantastic venue for the events with Arc Building Products in the Arklow IDA business park providing large test areas just minutes from exit 21 of the M11. In keeping with the style of the TDC Howard Wilde event the tests will be complex but open in nature and suitable for road going cars as well as Autotesting Specials with classes for both. It would be great to see some new faces out on Hewison events and this year it would be easy for Dublin based competitors to get in 7 events within 2 hrs of the city. Entry forms and regulations will be available from the club soon.